Concrete is an agglomerate of sand and a coarse material (such as gravel) that, when mixed with water and a binder, hardens to form an artificial stone (Newby). Its use dates back to the Romans, who used pozzolana, a ground volcanic rock, as a binding material. A prime example of this is the construction of the 43m diameter concrete dome of the Pantheon in first century Rome, which still stands today. 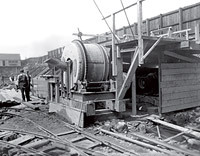 The subsequent use of concrete in European manufacturing relied on lime as a binder. This was not ideal, as lime concrete did not set under water. This problem was solved by the rediscovery of pozzolana in the 18th century as a binding material with hydraulic properties, and the use of 'Roman cement' in construction was popularised from 1796 by the French engineer L.J. Vicat (Vicat). The first artificial hydraulic binder, 'Portland cement' was produced and patented by British stonemason Joseph Aspdin in 1824. The increasingly widespread use of concrete in England and France shifted its status from a craft to a scientific industry, and to the use of more elaborate investigation into its material properties. The development of reinforced concrete  or 'ferro-concrete'  from the mid 19th century marked a European shift in the kinds of structures that could be built with concrete, and its status as a building material. 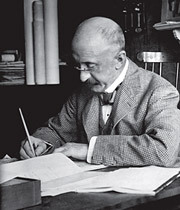 While his compatriot François Hennebique was crucial in popularising the use of reinforced concrete on the continent, Louis Gustave Mouchel was central to its use in construction in the UK. A cement mixer in the stonemason's yard during construction of the reinforced concrete-frame Royal Liver Building (1911) in Liverpool  the UK's first 'skyscraper'.